The World of Nematodes - The wormherders' journal of photos and stories from the field. 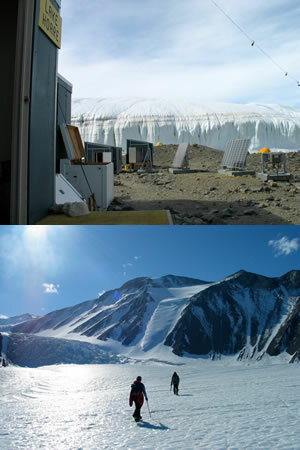 LIFE in the EXTREME - Anna's blog about extremophiles and the extended season. Polar Soils - Post-doc Becky Ball at Dartmouth college is studying soil carbon cycling, stoichiometry and soil biota in the Dry Valleys. Kathy Welch - Analytical chemist, geochemist, and golden beaker. Sarah Fortner - PhD student and geochemist. Chris Gardner - Analytical chemist, geochemist. Chris will be answering questions from Erin Dowling's 2nd grade class in Columbus, OH. Matt Hoffman - Glaciologist, PhD student. LeeAnn Munk - Geochemist from the University of Alaska-Anchorage. Former buckeye. Not all MCM Team members are in the field at the same time - more will be added as they become available, so check back often. We will be updating through February of 2008.